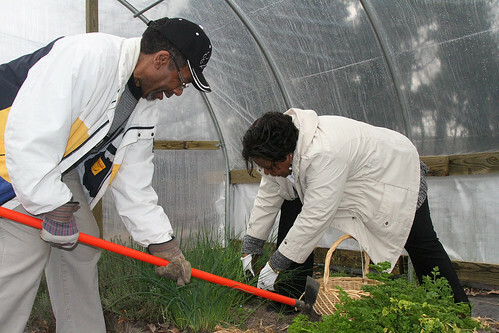 Lee and Linda Marshall harvest herbs in the church’s seasonal high tunnel (NRCS photo by Barbara Bowen). One high tunnel can’t feed the world, but it can make a world of difference in providing fresh fruits and vegetables to those with limited access to healthy foods. These plastic covered structures use natural sunlight to create more favorable conditions for vegetables and specialty crops. And for the 31st Street Baptist Church in Richmond, Va., one high tunnel has given them a new identity as an urban farm and model for community agriculture. The church’s senior pastor, Dr. Morris Henderson, began this new chapter in 2009 when he expanded their small garden to meet a growing need. The local soup kitchen had closed and members of the congregation were bringing their own food to help the local poor and homeless. During this time, Vernon Heath, a small farm agent with Virginia State University, suggested the pastor contact the Natural Resources Conservation Service (NRCS) to submit an application for a seasonal high tunnel. Initially offered as a pilot project under the “Know Your Farmer, Know Your Food” initiative, high tunnels can also help increase the availability of locally-grown produce in food deserts, like the one in Richmond’s Church Hill community. 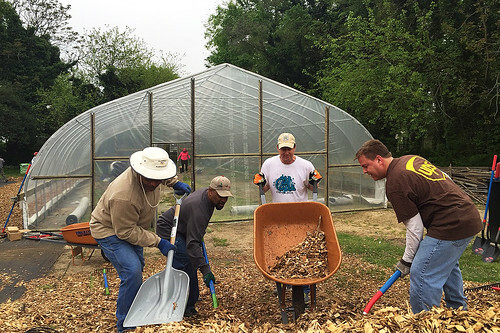 The church worked with NRCS conservationists and state and federal partners to expand their Darrel Rollins Memorial Community Garden into a year-round operation. They also brought in Tricycle Gardens, a non-profit that has been growing food in the city for a decade. They helped manage the farm and offered fresh, locally grown produce through a church-hosted farmers market. The group is maximizing production in minimal spaces with an additional high tunnel, as well as adding a flower and herb garden to bring beauty and revenue to area churches and restaurants. Executive Director Sally Schwitters also plans to create a healing garden to serve as a place of rest and refuge for workers and visitors. USDA’s Food and Nutrition Service (FNS), a key partner in this alliance, has been working to increase access to more than 130 farmers markets across the state by encouraging more market managers to accept Supplemental Nutrition Assistance Program (SNAP) benefits. With funding from Bon Secours Richmond Health System, residents are able to double the value of their SNAP benefits at the market every Thursday. To learn more about how USDA is working to increase access to fresh foods at local farmers markets, visit http://www.fns.usda.gov/ebt/learn-about-snap-benefits-farmers-markets. Information about the NRCS Seasonal High Tunnel Initiative is also available on the agency website.